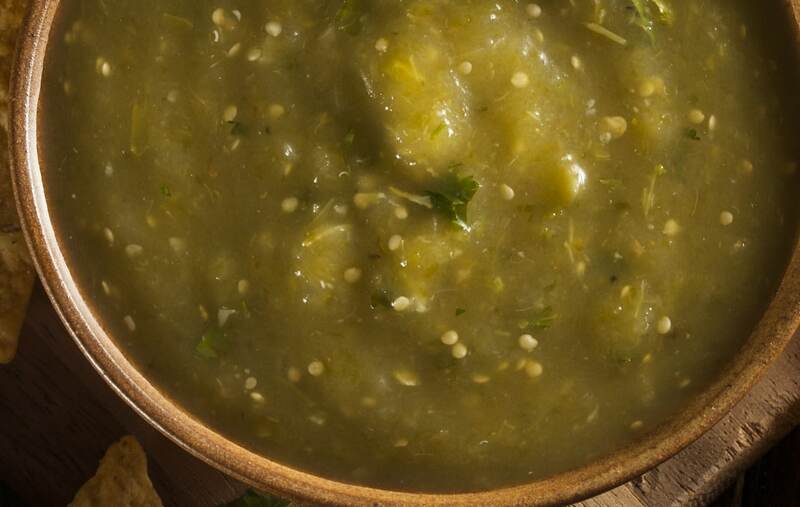 Tomatillos are the real star of this green enchilada sauce. Their delicious fruit-like tang is a perfect complement to enchiladas (and other rustic Mexican cuisine as well). But they aren’t the only green things that matter in this enchilada sauce. Both poblano peppers and jalapeños have big roles, especially if you keep the seeds in the jalapeño to gain the extra heat. This green enchilada sauce also works quite well as a side with tortilla chips. If you want it thicker, just stop after step 8 and use the thicker version of the sauce as a spicy tomatillo salsa or use less of the stock during the last steps of the recipe. Pre-heat the broiler. Cover a baking sheet with aluminum foil and lightly coat it with oil. Remove the husks from the tomatillos, then rinse and pat dry the tomatillos and chilies. Spread the tomatillos, jalapeño peppers, and poblano peppers on the baking sheet. Lightly drizzle oil across the vegetables to top coat, then lightly dust with salt. Place the garlic cloves on a small piece of aluminum foil and lightly coat with olive oil and salt. Wrap the foil to cover the garlic cloves, then place it on the baking sheet as well. Put the baking sheet under the broiler and broil the tomatillos and chilies for approximately 5 to 10 minutes, or until they slightly char. Remove the baking sheet and flip the tomatillos, jalapeños, and poblanos. Place the onions on the baking sheet as well. Put the baking sheet back in the broiler and broil for another 5 to 10 minutes, until the tomatillos and chilies are lightly charred on the new side. Remove the baking sheet from the oven and set to the side to allow it to cool (5 minutes). Remove the garlic from the aluminum foil at this point. De-stem the chilies, then place the tomatillos, jalapeños (seeds in for hotter or remove seeds for milder), poblanos, onions, and garlic in a food processor. Pulse blend until roughly chopped, then add half the cumin (1/2 teaspoon), cilantro, and half the lime juice (2 tablespoons). Pulse blend again until the mix reaches a rough sauce texture. 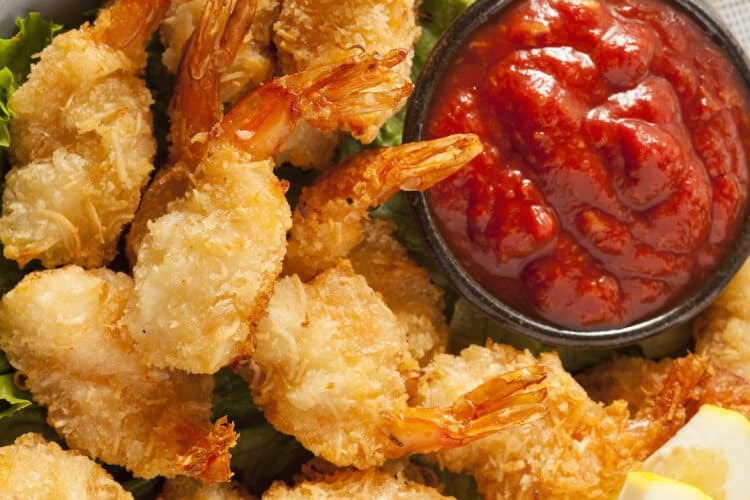 Set the rough sauce to the side. 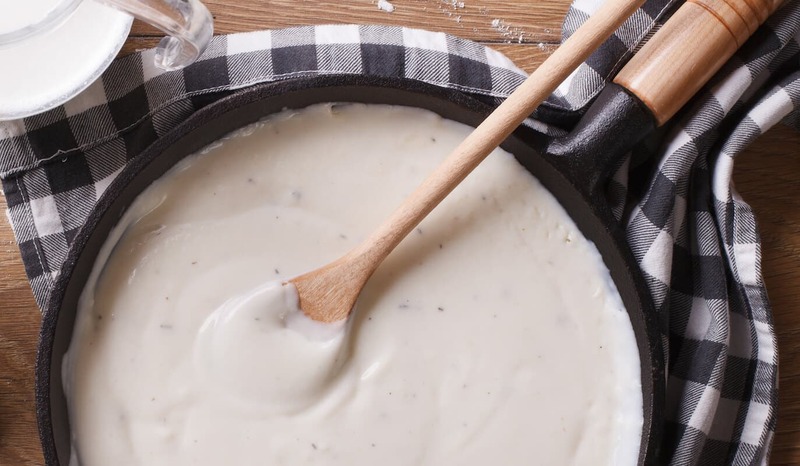 In a saucepan over medium heat, heat the 1 tablespoon of oil then add the flour. Stir the flour with the oil until it forms a paste. Add the vegetable stock, milk, half the lime juice, coriander, and half the cumin, and stir to combine with the flour paste. Bring the stock to a simmer. Add the tomatillo and chili sauce from the blender, and stir to combine. Allow the sauce to simmer to thicken the sauce, or add more vegetable stock to thin. Add salt to taste.